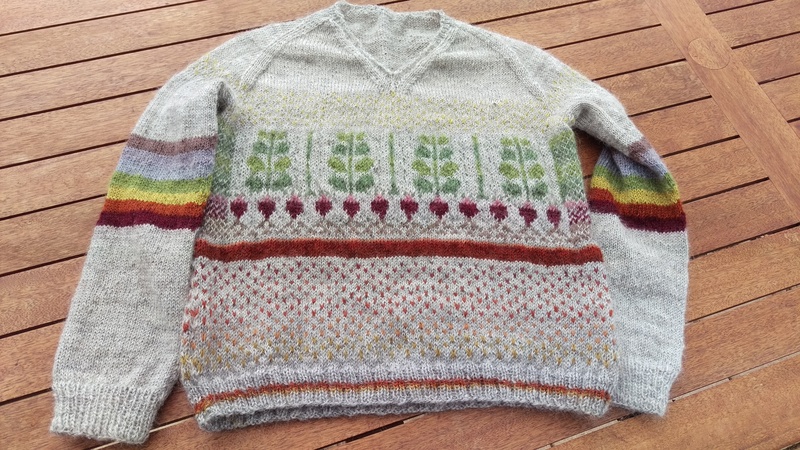 I have finally finished the colourwork jumper. The design includes beets from Kate Davies‘ Beet Heid tam. It’s a variation on her Neep Heid pattern. I love her designs, though to be honest I can’t picture myself personally wearing many of them (which is just not the same question). And, I tend to knit simple. I am a long time reader of her blog: she is a lovely writer too. 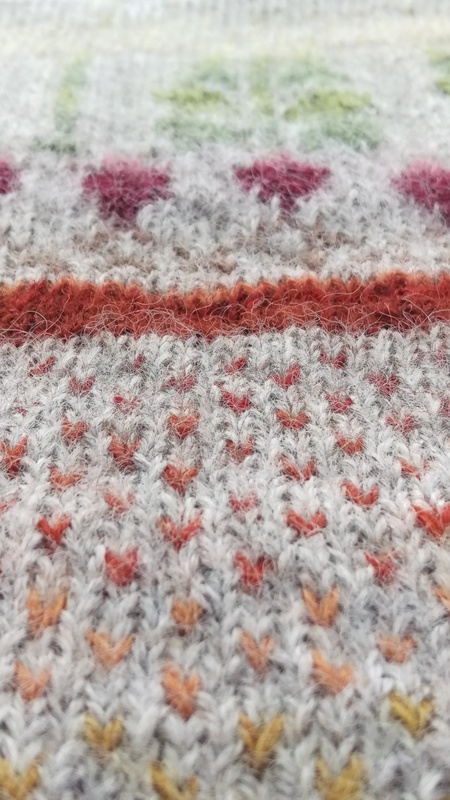 But this application of her design is all my own strange idea, with the jumper knit–or at least I tried to knit–to measurements from one of the recipient’s hoodies. 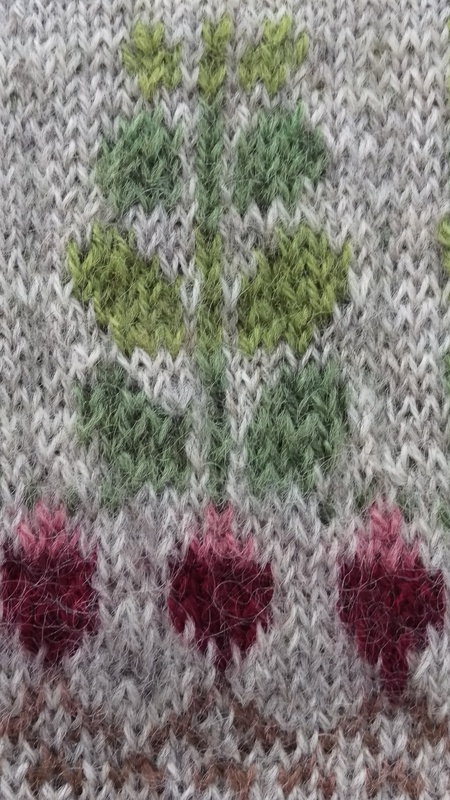 I see on Ravelry that one person has been moved to knit a neep cardigan, and there are a massive number of tams too, neep-, beet-, acorn- and radish-heids among them. I’ve knit this jumper for my fairy goddess son, who is a true admirer of gardening, vegetables in general and beetroots very much included. Those who are curious about the dyeing can find a bit of a summary here. He is a lover of colours too, and when asked his favourite colour in my hearing at any time, has responded ‘the rainbow!’ with a huge grin. 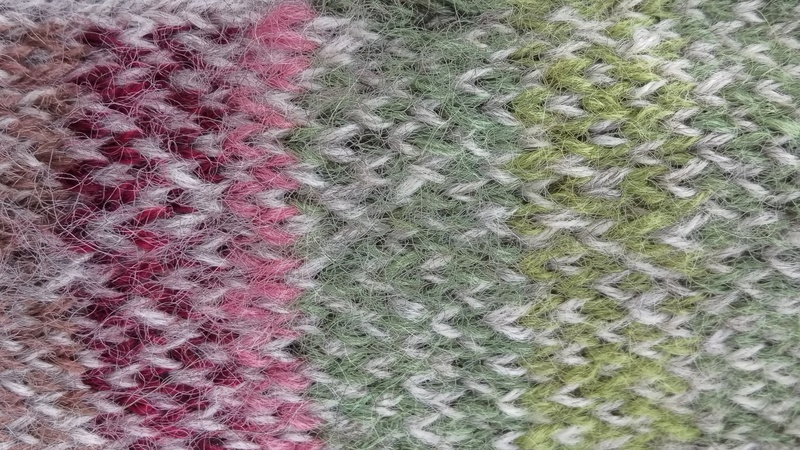 I knit this jumper from the fleece of a sheep called Viola and all these colours are from plants with the exception of the deep beet colour and the pink, from cochineal. I admit this rainbow is not exactly classic in colour and the woad colours are very pale in the zone of blue and indigo! 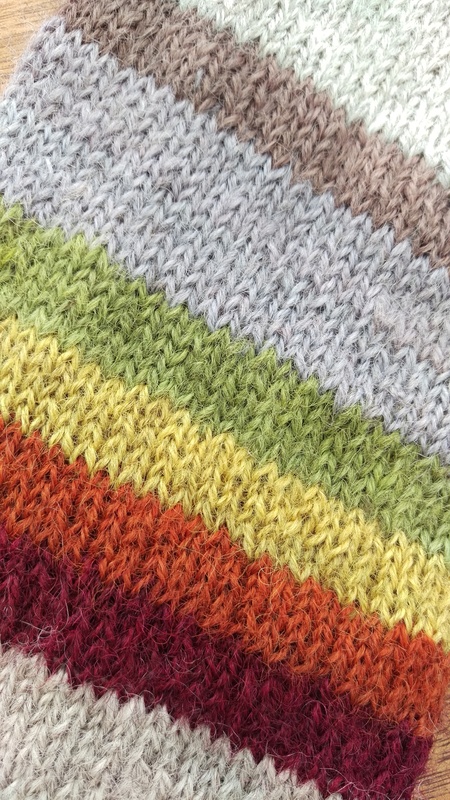 I loved having so many colours to play with but took advice from one of my knitting companions in Wellington and kept the neck and shoulders simple. I dealt with the maths of the pattern repeat with some simple patterning under the sleeves. And now that it’s finished, I can give in to the urge to cast on all the small projects! What I enjoy looking at isn’t nearly the same as what I’d wear at all times. I haven’t really found a use for my plant dyed yarns (probably because of the yarns), so it’s nice to see some knit up. The beets are really cute. It’s amazing! 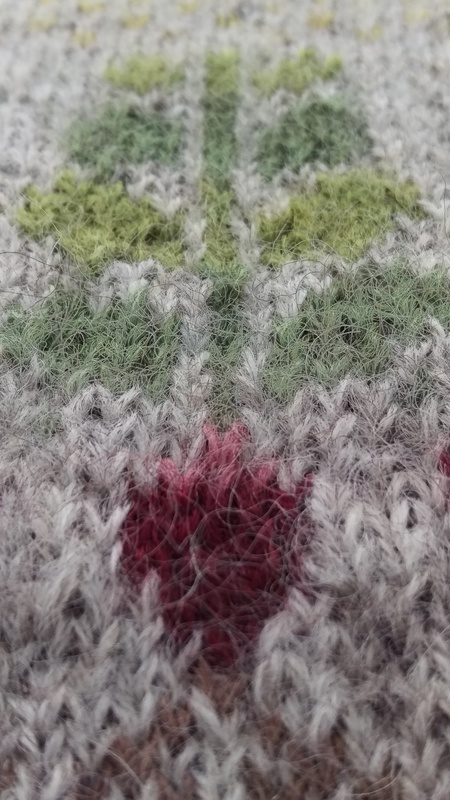 The blend of design motifs, subtle colors, and sweater pattern creates such a rich and pleasing whole. That is so kind of you! Thanks so much. quite fabulous – lucky recipient of so much talent and love and time. Thanks a bunch for your kind compliment! Isn’t it true that the love and time are at the heart of it? Wow!! Subtle yet bright and fun. This is truly an art piece and labour of love. The hours of work lovingly knitted into a wonderful gift. What a whirlwind of creativity you are. What a truly rich compliment, Keryn! Thanks so much. It’s true there are only so many jumpers a person can wear–except when they keep growing, which is where smaller friends come into it! Thanks for your kind congratulations. I love it!! He’s one lucky little guy to be receiving this amazing jumper…… I can imagine his joy upon seeing it, and wearing it. I feel so lucky to have him in my life. He is so dear to me and such a fine appreciator of handmade treasure! this is a lovely sweater! Thank you so much, Helen! I’m very happy with it! Thank you! I hope you manage to make one!